Fifteen years after September 11th, several books were published aimed at sharing the experience with young people. It made me wonder if fifteen years was no longer considered “too soon” or if writers wanted to commemorate the tragedy for readers who were too young or not alive to understand. 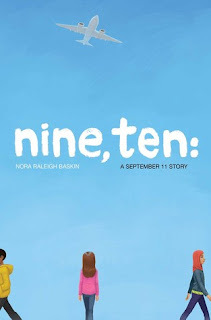 For me, it would still be too heavy to read all the 9/11 books, so I chose Nora Raleigh Baskin’s Nine, Ten. Nine, Ten tells vignettes of young people in the days leading up to September 11th. The reader watches the hours tick by with impending doom as parents head to meetings at the World Trade Center, a character befriends a fireman, and a Muslim student struggles with how much she needs to explain her hajib to her classmates. While I wasn’t particularly attached to any characters, I worried about how the events would affect them. Baskin chooses to skip most of the horror of the day and its aftermath, keeping the novel safely in middle grade territory. In focusing on individual people, she helps young readers understand how unprepared everyone was for the events of September 11th. My favorite part of the novel was the end, when the characters’ stories intersect and made me tear up. While this won’t inform readers much about September 11th, it will give them faces to the humanity behind the history.